Day 2 - 11:29 am - Made my way down to Union Square, and took in the sights and smells at the Farmer's Market, since I had a few minutes before the start of the next film, Chevolution. 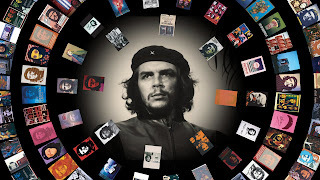 12:45 pm - Chevolution, a documentary directed by, is a slickly produced piece focusing on the ubiquitous image of Che Guevara, known as Guerrillero Heroico, that has become so iconic, it is purported to be the most reproduced photographic image of all time (according to the V & A Museum in London). The doc strives to place the image in a historical, political, artistic and ethical context. Directed by Trisha Ziff and Luis Lopez, it is a film edited and shot for maximum aesthetic impact. Unfortunately, it is to the detriment of the film's thesis. While the historical and artistic context are well described in the feature, short shrift is given to some of the realities of the politics involved. Much is made of the fact that Che was an idealistic revolutionary, and how the capitalism inherent in the use of his image on T-shirts would have been anathema to Guevara's socialist philosophy. But little voice is given to the opposing viewpoint that this idealistic revolutionary was also responsible for executions of many Cuban dissidents during his tenure as comandante of Fidel Castro's regime in Cuba in the early 1960s. True, the dissenting viewpoint appears in the film, but it is only after more than an hour of establishing Guevara's heroic mystique. And this viewpoint is spoken of way too briefly, and by too few interviewees, to give the argument any weight. While I wouldn't go as far as calling the film propaganda, as many in the exile community in Miami probably will (if it ever sees the light of day there), I will say that the film feels slanted without the balance that viewpoint would provide. 5:33 pm - Dinner at Pazza Notte (1375 6th Ave, 212-765-6288) is a nice surprise, with prompt service, and serviceable if not stellar food. Started with the wonderful Beef Carpaccio for my antipasto. The main course was the Baccala con Succo di Zafferano, a roasted Chilean sea bass in saffron sauce with sauteed spinach and fingerling potatoes. The fish was perfect, flaking off easily with that melt-in-your-mouth texture. However, they went a little overboard on the saffron sauce, which masked, instead of enhanced, the taste of the sea bass. The sauteed spinach was crisp, but entirely too much garlic was used in its preparation, as it took me several minutes to extract it. 7:00 pm - At the Museum of Modern Art, Tribeca, in conjunction with Paramount Pictures and MoMA, presented its final restoration of a cinema classic, Once Upon a Time in the West. Directed by Sergio Leone (The Good, the Bad and the Ugly), starring Henry Fonda, Claudia Cardinale, Charles Bronson, Gabriele Ferzetti, and Jason Robards, this is probably his most underrated western (although Duck, You Sucker is gaining a new status in that category). The film was introduced by Barry Allen of Paramount's film restoration department (who is so obviously happy with his rewarding career). He was beaming as he described the amount of work that went into restoring the film's color (difficult considering the film was shot in the now non-existent Techniscope format), and its now revelatory soundtrack. Leone shot parts of this film in the red-earthy Monument Valley, an homage to John Ford's earlier westerns. He went to great lengths to match the red dust in scenes he shot in other locales, importing much of that earth to those locations. This restoration makes that effort worthwhile, as the brilliant reds are much more evident than in previous releases. Leone was one of the pioneers when it came to designing the use of sound to manipulate his audience. The first scene of this movie is a perfect example of how he ratchets up the tension by minimizing the dialogue and moving the ambient sound to the fore. Three men wait to ambush the protagonist at a train station. The creak of the wooden floorboards as Woody Strode's bad man walks across the platform; henchman Jack Elam's blowing off the buzzing fly that keeps annoying him because he's too lazy to swat it; and the weather vane's unique high-pitched squeal as it turns in the wind are all memorable. The restored soundtrack is a revelation. We can hear even the background extras distinctly as they make small talk when Cardinale's Mrs. McBain is unloading her bags from the train. I was ecstatic at the experience of sharing this film with an audience for the first time. The packed house was gleeful in all the same places that I've always been, and the film got a standing ovation. Hope to see this one released on DVD or Blu-ray soon. 11:05 pm - Acerbic cartoonist Bill Plympton presents his Idiots and Angels, after which he will answer questions. In his introduction, he says two key facts: it is his birthday, and he thinks this film is the first he's made that has the potential to break out. Though I have never seen one of his feature-length films, I am excited, since I have enjoyed many of his droll short films. This one's about a really malicious man who starts sprouting angel wings, symbolic of the last bit of good he has within him, and his efforts to get rid of them. Two things: I never enjoy films I start after 11:00 pm, and I usually start nodding off (and possibly snoring) at about this time. So I'm good for the first twenty minutes before I feel like the film is starting to drag. The woman next to me, who professed to being the biggest Plympton fan in the city, has only chuckled twice. Plympton is waiting outside for the film to finish, so he can come in and do a Q & A. I don't know at what point I started to nod off, but I do know at what point I started feeling guilty about it. Just the night before, I was so pissed that some guy in front of me snored through Toby Dammit, and here I was ruining it for others. But what a dilemma... I didn't want to walk out of the theater and confront the obviously inspired Plympton. I didn't want him to think that his movie failed, when I myself wasn't sure. Besides, it should be over by 12:20 am. I could soldier on till then. 12:10 am - I walked out of the theater with only ten minutes left to go. I just couldn't bear the discomfort anymore, and decided to take my chances. After all, Plympton wouldn't be right outside the theater, right? Wrong. I almost tripped over his legs as he sat in the hallway just outside the door, and I tried not making eye contact. So as far this film goes, I reserve judgement... for obvious reasons. MoMA Presents: Once Upon a Time in the West continues its exhibition thru Monday, May 5th, at the Museum of Modern Art, 11 West 53rd St, between 5th and 6th Ave, New York, NY 10019-5497, (212) 708-9400.